American president who was the 42nd president of the U.S. (1993-2001). For the announcement, in the East Room of the White House on 26 Jun 2000, President Bill Clinton was joined by British Prime Minister Tony Blair (via satellite), Dr. Francis Collins and Craig Ventner, President of Celera Genomics Corporation. Ambassadors from the United Kingdom, Japan, France and Germany were present in the audience, together with James Watson and scientists involved in the Human Genome Project. “Nearly two centuries ago, in this room, on this floor, Thomas Jefferson and a trusted aide spread out a magnificent map—a map Jefferson had long prayed he would get to see in his lifetime. The aide was Meriwether Lewis and the map was the product of his courageous expedition across the American frontier, all the way to the Pacific. It was a map that defined the contours and forever expanded the frontiers of our continent and our imagination. Science Quotes by President Bill Clinton. 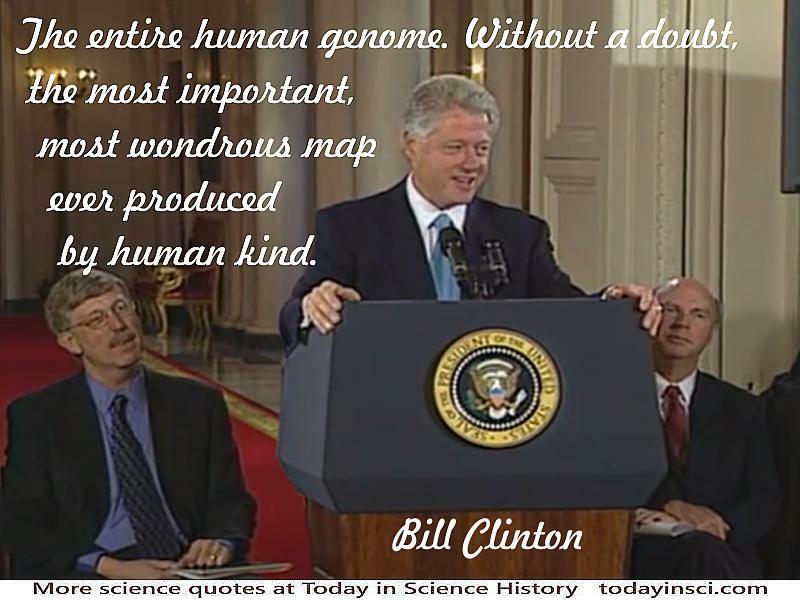 Bill Clinton - Context of the “Celebrate completion of the first survey of the entire human genome” quote - with medium image (500 x 350px). Bill Clinton - Context of the “Our children's children will know the term cancer only as a constellation” quote - with medium image (500 x 350px). Bill Clinton - Context of the “Our children's children will know the term cancer only as a constellation” quote - with large image (800 x 600px). Bill Clinton - Context of the “We are learning the language in which God created life” quote - with medium image (500 x 350px). Bill Clinton - Context of the “We are learning the language in which God created life” quote - with medium image (800 x 600px).